Jesus is my Superhero CD includes 15 live praise and worship tracks from the Hillsong Kids. The CD is the first first ever Hillsong worship album for kids, recorded over two mornings at KIDSONG during Hillsong Conference 2004. Jesus Is My Superhero was nominated for a 2006 Dove Award for Children's Music Album of the Year. 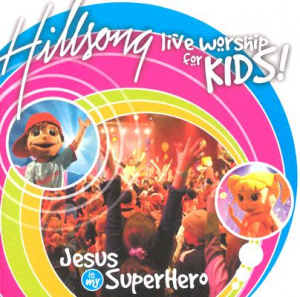 Jesus Is My Superhero CD by Hillsong Kids was published by Kingsway in July 2012 and is our 5068th best seller. The ISBN for Jesus Is My Superhero CD is 9320428002358. This dvd is an UNBELIEVABLE value and I can't wait for the next one to come out. The words "excellent" and "an extremely useful tool for the church" do not even begin to describe it. Wish the adults worshipped like this! I'm an adult and I love this CD! The songs are inspired, lively, fun and full of worship. Got a question? No problem! Just click here to ask us about Jesus Is My Superhero CD. Now Playing: Superhero Your browser does not support the audio element.